Valentine's Day means all-things red velvet. You can be traditional and go with cake or cupcakes, or you can step outside the box and red velvet-ize other desserts: brownies, cobblers, cheesecake, oreos... These cupcakes fall somewhere in between. It's a no-frills (yet still fantastic) red velvet cupcake base. But instead of the typical cream cheese frosting, I topped these with strawberry cream cheese frosting. They still have all the familiar flavors, but with extra sweetness from the strawberries. The tangy, slightly chocolatey flavor of the cupcake really pairs well with the tangy-sweet frosting. And aren't they festive? The only thing more festive than a red velvet cupcake is a red velvet cupcake with pink frosting. When I initially tasted one of the cupcakes, I didn't think the strawberry flavor was very prominent. But the next day, it was much stronger. So I'd recommend making the frosting at least one day before you plan to serve them. I hope everyone has a wonderful Valentine's Day, filled with lots of kisses and chocolate!! I've tried several recipes for red velvet cake, and this one is my favorite - both for flavor and ease of preparation. It has the perfect balance of sweetness, richness, and tang. And the color is so pretty! Preheat the oven to 350 degrees and line two cupcake pans with paper liners. In a large mixing bowl, whisk together the cake flour, sugar, baking soda, cocoa powder, and salt. Set aside. In the bowl of a stand mixer fitted with the paddle attachment, mix the eggs vegetable oil, buttermilk, food coloring, vanilla, and vinegar until well combined, about 1-2 minutes. With the mixer on low speed, slowly add the dry ingredients, and mix until just combined and smooth. Divide the batter evenly among the liners. Bake 18-20 minutes, or until a toothpick inserted in the center of a cupcake comes out clean. Cool for about 5 minutes in the pan, then transfer to a cooling rack to cool completely. Puree the strawberries and sugar in a food processor, then strain the puree through a mesh strainer to remove the seeds. Cream the butter and cream cheese in the bowl of a stand mixer fitted with the paddle attachment, until creamy and smooth, 2-3 minutes. Add the vanilla extract. Gradually add the confectioners sugar over low speed, and when well combined, increase to medium. Add the strawberry puree 1-2 tablespoons at a time, until you've reached desired flavor, consistency, and color. Beat until smooth. Chill the frosting for about 30 minutes before piping or spreading onto cupcakes. I love the idea of strawberry frosting rather than just plain cream cheese frosting. How have I never thought to combine red velvet and strawberry before?!? FABULOUS idea! Love the idea of topping red velvet with strawberry frosting! These are so pretty, and so delicious looking! What a yummy sounding cupcake. Great idea, Ilike these very much! What a great idea, Josie! I love how pretty these cupcakes look and I bet the flavor is outstanding. What a lovely photo! These are quite possibly the cutest thing I've ever seen! And you're so right about the festive factor--definitely one of those, "Why didn't I think of that?" moments. Not a fan of cream cheese frosting so I didn't make that, but the cupcakes are *perfection*!! I made them minis (baked for ~12 minutes), and they are just fabulous :) We made them for my twins' preschool teachers! 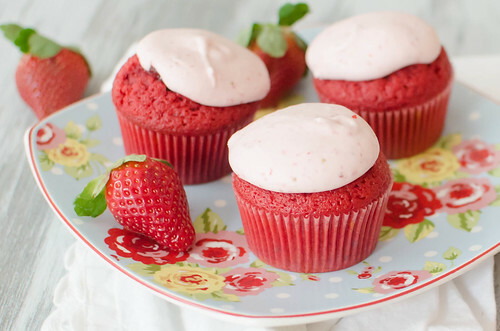 These velvet cupcakes are FAB and sweet. essay writers I'm sure it's very tasty! that's really a great post and i like this and thanks for sharing it with us! Get More Info. I think it is very tasty. Qualified team of experienced writers is ready to respond to write my papers request. each work will be written from scratch for sure. Looks so yummy! I'll cook it for my lovely daughter:). By the way, you have agreat opportunity to write papers without stress! I will try to cook шею I think, my friends from prime-essay will try to cook it too!